Inspired by a video I saw about Fun Theory, I wrote a post recently about remembering to use fun as a motivator for learning. Today I decided to put my own words into action. I would see if by applying that principle, I could take another step forward in learning how to use Photoshop. Here's what I wanted to do: a wonderful group of Australian children's writers I belong to has a tradition of posting about their New Year resolutions. I decided I would publish mine in the form of a Wordle. This is such a great web 2.0 tool, and a lot of fun for kids and adults alike. 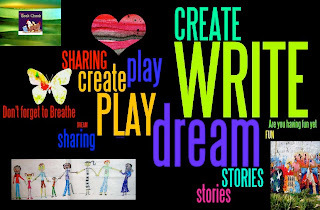 Serendipitously, I saw a post on Angela Maier's blog about adding images to Wordle. Mmmm, a way to satisfy my love of words AND images, as well as provide motivation for me in 2010. The snag, which I'm sure you saw immediately, was that I didn't actually know how to do that. I tried fiddling around with a couple of programs I thought might do it, but alas, it seemed Photoshop was the answer. And Photoshop is HARD when your brain is mostly feathers! That's when I remembered fun. It would be much more fun if I wasn't trying to learn how to do it by myself, right? And THAT was when I remembered my son is home on holidays. Such fun to spend quality time together with him teaching me how to put pictures into a Wordle! It took hours, but I am delighted to say I now understand much more about "layers" and "flattening" and other arcane rites. Great to have still more proof that having fun and an authentic purpose is an excellent motivation to learning. Did my son have fun too? I'm sure he must have. He did grind his teeth several times, and okay, he spent quite some time with his head sunk onto the desk. And yes, he joked around with cute sayings like, "Mum, will you PLEASE shush and LISTEN to me!" But I'm pretty sure he's looking forward to our next lesson. I hope you like my presentation of The Book Chook resolutions for the coming year. If anyone would like to make one for themselves, I am now able to help. If you'd like me to post directions, let me know in comments, or email me via the contact tab above. And here's to a wonderful 2010 for us all! It looks great Susan and I am inspired to have a go myself. I may well be in touch! Happy New Year. Please, explain how you managed to add the pictures to the wordle. I bought Photoshop Elements a few days ago and now I'm struggling to learn how to use it. Maybe you or your son can give me a few good hints. Congratulations for your excellent work and happy New Year. A couple of people have asked, Joy, so I am going to try to make a tutorial about it. Should be interesting to see if I can actually remember what to do! Hi Joao! I am so glad to hear I am not the only one who struggles! I can do basic things like resize photos or change them to different formats, and the other day I made a (VERY) basic logo. What I really want to be able to do is to create my own pictures and art work for the magazines I publish at www.susanstephenson.com.au. I'll get there, but it will likely take a year. I thought I would try Screentoaster to make a tutorial. Look for it here soon. Very cool, Susan. And I love your resolutions - especially 'don't forget to breathe'. Very important! I do actually quite often forget to breathe properly, Sally, hard though that may be to believe! "Breathe" is also a code word for me. It means take a step back, take a deep breath, build some quiet time into your life. If you are the "Sally" I suspect, I'm thinking 2010 will need a few built in breathing moments for you too! I love the fun theory video. I blogged about that myself not too long ago. Wordle is addicting. I like your idea to use it for your resolutions. Love your new year's resolutions, Susan - I still have to post mine. Your Wordle presentation looks great - what a handy tool - and handy to know how to use too. Fun Theory: Did you see the garbage bin one, Nora? I can just imagine rubbish-free playgrounds if we had those available! The more I get to know Wordle, the more I realise how versatile it it. It's simple to use too, Dee - always a plus for me! Hey, Angela! How great that you visited. I'm glad you were able to see what your post inspired! I would love for you to email or post your directions to this! VERY creative!! !